WNBA Enterprises brings you the Verizon WNBA All-Star 2018 Sweepstakes where they will be giving away a 3-day/2-night trip for two to Verizon WNBA All-Star 2018 in Minneaplois, MN on July 28, 2018 to one lucky person. Visit this link: wnbaallstar2018.com to go to the sweepstakes page. When To Enter: The sweepstakes begins at 12:00:00 PM Eastern Time (“ET”) on 5/19/18 and ends at 11:59:59 PM ET on 7/13/18. Sponsor: WNBA Enterprises, LLC, 450 Harmon Meadow Blvd., Secaucus, NJ 07094. 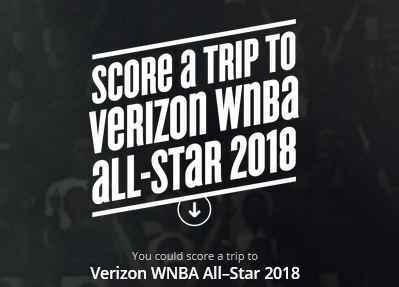 Sweepstakes Prize: A 3-day/2-night trip for two to Verizon WNBA All-Star 2018 in Minneaplois, MN on July 28, 2018 consisting of round-trip coach air transportation from major airport nearest to winner’s residence in the U.S., standard double-occupancy hotel accommodations (one (1) room), two tickets to the WNBA All-Star 2018 Game and ground transportation to/from the airport and the applicable hotel (Approximate Retail Value “ARV” =$4,000).